Zuni Silver | First Edition 1E Ponies Figurines | One Price Low Flat Shipping! From the Trail of Painted Ponies Retired Native American Collection, Zuni Silver. Designed by artist, Lynn Bean. Made of hand-painted resin. Measures 6" tall. 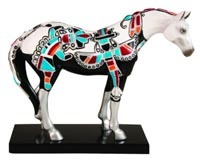 This gorgeous pony is part of Native American Collection. It honors authentic Native American arts and heritage. The Zuni Tribe of New Mexico is known for its elaborate jewelry and superb silverwork, inlaid with hand-carved precious and semi-precious stones (turquoise, jet, coral and mother of pearl) that represent animals and spirits and are said to have mystical significance. Working with designs found on old Zuni silver jewelry, this Designed by artist, incorporated images of Rainbow Man – the Zuni symbol of the supreme Kachina spirit of harmony and healing – the Thunderbird and a Dragonfly, onto a Pony, endowing it with the power to master the unpredictable forces normally beyond our control. This is a first edition version, brand new in original packaging.